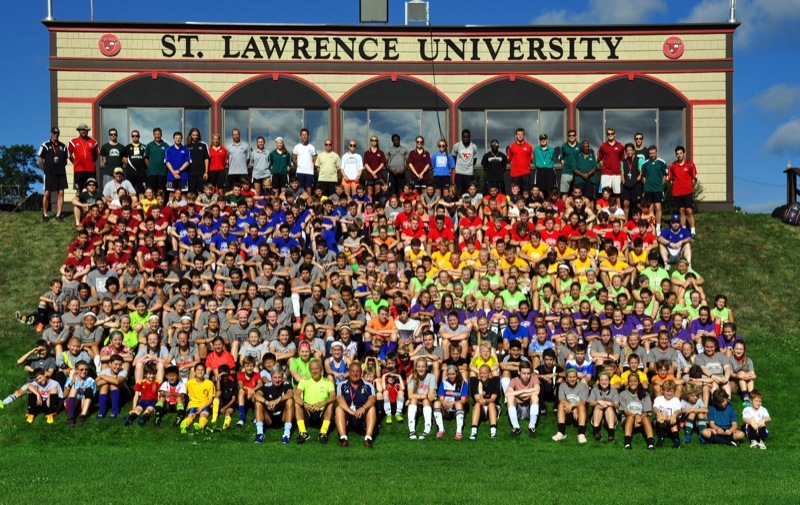 Started in 1976, Lake Placid Soccer Centre has earned a reputation as a top-class teaching and educational summer soccer program. Our UNIQUE core is the integration of The Coerver® Coaching Method into our camp program. Size, age and gender are relatively unimportant to the playing of soccer. It is a game of fundamentals. We teach these fundamentals through a skill instruction format and daily camp plan that provides a solid foundation for each soccer player to utilize in order to improve their overall performance on the field. Our week long camp sessions have been fine-tuned over the years to achieve the perfect blend of intense, on-field training time, lots of match play and a quality social experience. Our philosophy is simple: a love of soccer, the outdoors, hard work and good sportsmanship. Founded in 1976, Lake Placid Soccer Centre has over 40 years of experience to draw upon. Our weekly overnight sessions provide the perfect balance of intense, on-field training with a quality social experience for kids away from home. The BEST camp anywhere for a first time sleep-away youth soccer camp experience. We utilize the renowned Coerver® Coaching Method especially developed to teach individual skills & team tactics to young players. Coerver® Coaching is currently used all over the world and is endorsed by the world’s leading soccer organizations including UEFA and FIFA and is integrated into many top college and professional team training programs. Each Camp day is filled with nonstop, engaging activities with great staff. The Lake Placid Olympic Region which is centered inside the Adirondack Park has thousands of beautiful mountains, lakes and rivers – this make upstate New York the perfect place to attend summer camp. The cool climate is ideal for soccer training, and the region is a great vacation destination for parents too! Our premier soccer facility at St. Lawrence University is unbeatable, nothing in the Northeast USA or Canada compares to this facility (two indoor facilities). Camp security 24/7. Best food! We offer a variety of programs for girls and boys of all ability levels and our special sessions for Teams, Goalkeepers and Premier/Advanced field players are cutting edge. In 2006 we initiated a new Premier/Advanced Elite program for young play- ers age 11-13 and the feedback and results were outstanding. Our Mighty Mites for age 5 – 8, half day soccer sessions have a complete program that has been copied nationwide since LPSC designed a full program for this age group in the late 1980’s. Whether your child is tearing up the field’s in suburbia somewhere or just starting first steps and kicks in soccer the MM kids have a blast and learn new moves complete with daily lunch and the famous LPSC Water Olympics. TEAM CAMP – we have been training club, high school, modified and college teams since we began in 1976. We also conduct courses for the various coaches and parents of the Team’s we host with our top International Staff. The LPSC TEAM Camp facility at St. Lawrence University is unbeatable and our TEAM program allows for ten (10) matches over 6 days. We never forget that fun is an important part of summer camp. Our campers have plenty of time to relax, swim and participate in lively events like talent shows, dances and the famous Face Paint World Cup Tournament. Check out over 43 years of smiling faces & great soccer action at our website, YouTube, Facebook and Instagram!